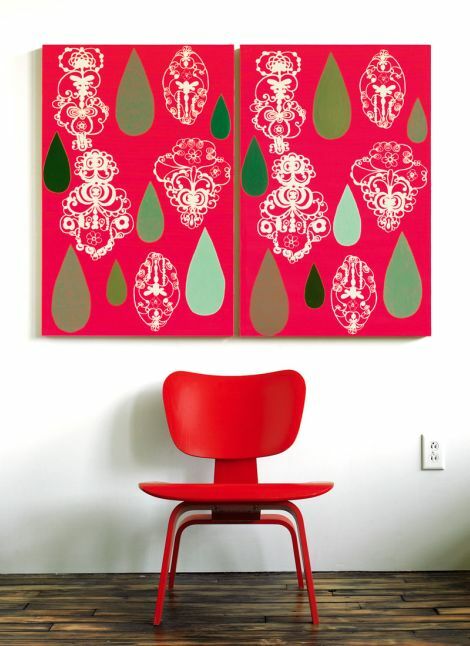 “what if bootsy collins played versailles?” this philosophical question should give you an idea of the quirky genius behind this hand painted, hand screened single sheet wallpaper from artist karen combs for her massachusetts company, nama rococo. back in the day, karen was inspired by a chinese scroll in a museum, and wanted to see her artwork on a larger scale. she created a piece on a 50 foot roll of paper, and was inspired by the concept of converting her designs into a repetitive, rhythmic pattern. the wallpaper idea came naturally after that. the joyful exuberance in their hand mixed color selection is stirring. 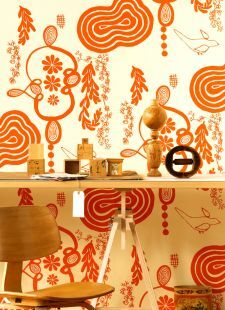 and the abstract, fresh approach they have, mashed with a more traditional ornate decorative style, results in revved up, sprightly patterns on acid free french paper that make you stop to stare and watch the show. i love the high quality, fine art approach to their craft. 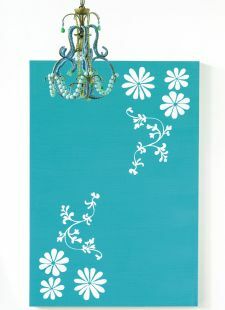 these single sheets are not inexpensive (e.g., the french dot pattern is $220 for a 25″ x 38″ sheet), but when you think about how much a large centerpiece painting for your room would cost, it seems pretty comparable. knowing that it’s quite a labor of love make it even more valuable. find more info and see all the wonderful selection here. wow, those are brilliant! rather out of my price league, however. they are so cool aren’t they? i agree they are more of a luxury splurge but the collection starts at $98 each (i used the french dot as an example because i find it dazzling, and it is the most expensive). I’m all over that Bootsy Collins concert in Versailles. Did you manage to get tickets? yes, bob — our tickets are on the first balustrade, between the the fountain and napoleon’s wash basin.